PADDLEBOARD FITNESS SESSIONS AT BEAUTIFUL WALNUT CREEK! 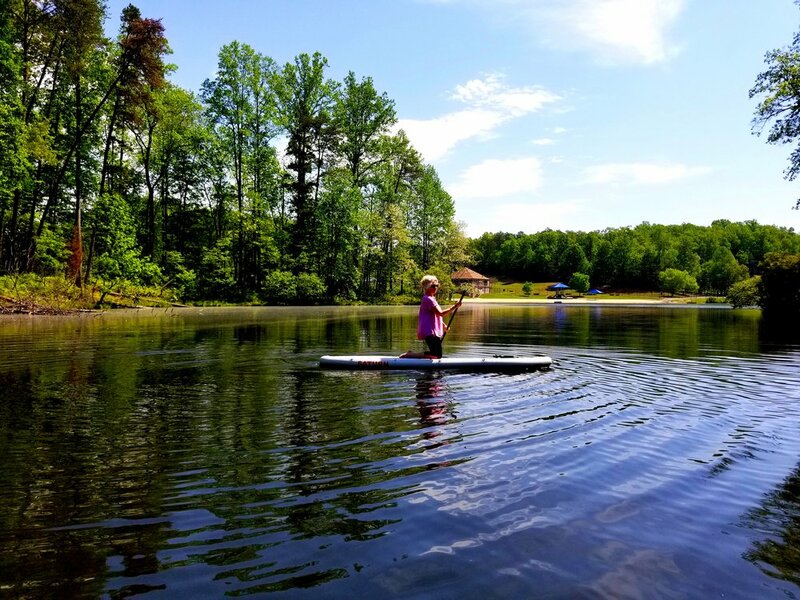 One-on-one private fitness sessions on Stand Up Paddleboard (SUP) are a great way to get some exercise in a picturesque natural setting. This is a fitness class like no other! No Paddle experience necessary! These sessions are designed for beginning or intermediate paddlers and are tailored to your comfort level, even if you prefer not to stand. Also a great cross-training option for runners or cyclists, an inspiring way to change up your regular fitness routine! The experience begins with safety, paddle, and launch instruction on land. We will paddle the lake to an anchoring spot to perform the fitness session. This is a whole body toning session with an emphasis on the core and fused with mind/body elements. We finish the session off with a few minutes of guided meditation, while peacefully floating on the lake, and then paddle back. Click on the left video below to view some examples of the exercises from the Beginner Paddle Fitness Sessions. Been on a board before and already feel comfortable paddling? After brief safety instruction, we'll launch right away and paddle to the anchoring spot. The whole body toning fitness session will include more advanced exercises than the beginner sessions. Participants must be 18 years of age, be comfortable on the water, and know how to swim. Participants should also be able to bend down, kneel, and be comfortable putting weight on the knees. Please note inflatable boards have a 220 lb. weight limit. Paddleboard, paddle, life jacket, leash, and waterproof cell phone case provided. Please remember to bring a water bottle, sunscreen, and cash for Park entrance fee. You may also wish to wear sun-protective clothing, sunglasses and/or a hat. Walnut Creek is located just 20 min from downtown Charlottesville. Sessions available Wednesday-Saturday mornings and Wednesday afternoons. "I didn't know quite what to expect when I signed up for an SUP fitness session with Jess Miles Fitness. I was surprised to find it both challenging and relaxing at the same time! It was a good change from running and was a great full body workout. I would recommend checking it out if you're looking for something to change up your routine. And who doesn't want to spend time on the water?" --Sarah C.
Please contact Jess to schedule a session today! !